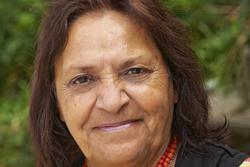 Josie Wowolla Boyle is a Wonghi woman who was born in the desert of Western Australia. She is an acclaimed storyteller, singer and artist who has been enchanting children of all ages since the 1980s. Josie performs in primary, secondary and tertiary institutions. She has made a number of recordings, worked as an artist in residence and featured on ABC’s 5 Nations’ Dreaming stories. She is also a regular presenter in literature and music festivals across WA. In 2012, Josie published her first children’s book, Bubbay: A Christmas Adventure with Magabala Books.